Each box contains 6 x 3.5oz pouches of mini organic granola balls. Delicious combination of sweet banana and rich chocolate. Made with Gluten-Free Oats and allergy friendly. 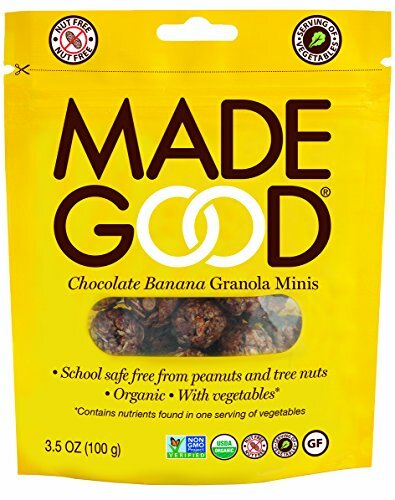 Organic, Non-GMO, these MadeGood snacks contain one full serving of vegetables, Free-from the 8 common allergens. Small granola bites are perfect for sharing and loved by kids. Manufacturer: Riverside Natural Foods Ltd. Publisher: Riverside Natural Foods Ltd. Studio: Riverside Natural Foods Ltd. If you have any questions about this product by Made Good, contact us by completing and submitting the form below. If you are looking for a specif part number, please include it with your message.